MITZPE RAMON, ISRAEL — This is my 14th visit to Israel. I’ll be spending ten days here doing fieldwork in places I’ve come to love: Makhtesh Ramon, Makhtesh Gadol, and the Aravah Valley. I’ve returned to complete some Jurassic studies, explore a bit of the Cretaceous, and collect specimens for future Independent Study projects by Wooster geology majors. I’ve also come to work with an excellent Israeli graduate student, Yael Leshno. I’ll introduce her and her project later in this blog. 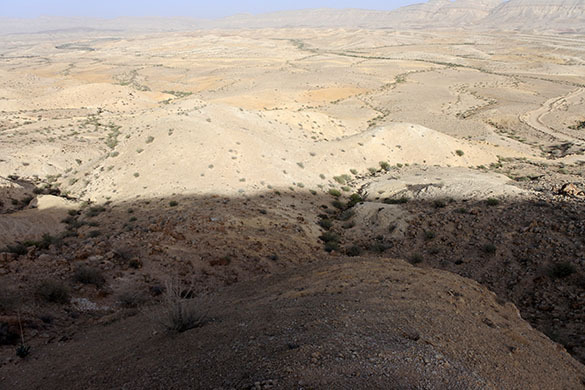 The top image is of my first field site of the trip: an exposure of the Ora Formation (Upper Cretaceous, Turonian) at Gerofit Junction at the edge of the Aravah Valley in southern Israel. It is a fun location because you can eat lunch while gazing at mountains and valleys in nearby Jordan. Of course, since it is the junction of routes 40 and 90, it’s a noisy place. 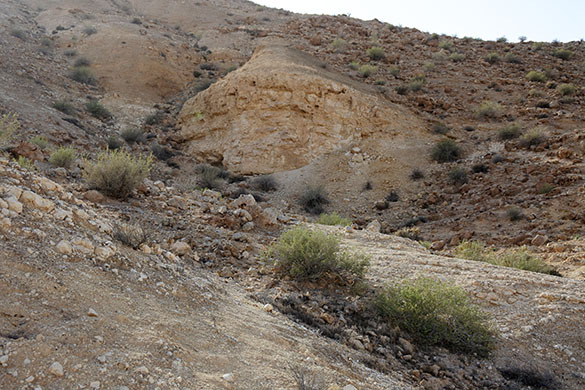 The Ora Formation is well exposed north of the road junction. 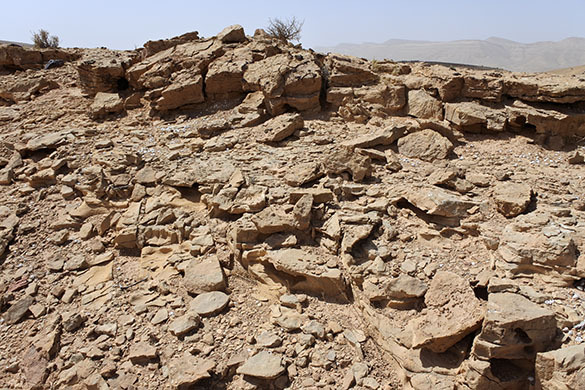 This outcrop is significantly faulted, so you must pay close attention to the stratigraphy to work your way through it. This is a low-angle normal fault. Note that it does not cut the topmost units. All sorts of tectonic situations are possible here next to the Dead Sea Transform system. Dr. Judge would love these structures! Me, not so much. 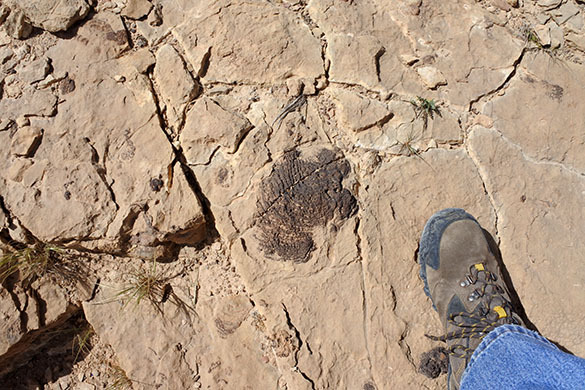 Parts of the Ora Formation are very fossiliferous. This is a platy limestone rich in small oysters. Other beds have zillions of tiny gastropods, still others with plant and terrestrial arthropod remains. I came here ot find bryozoans, but found only a single specimen encrusting an oyster. 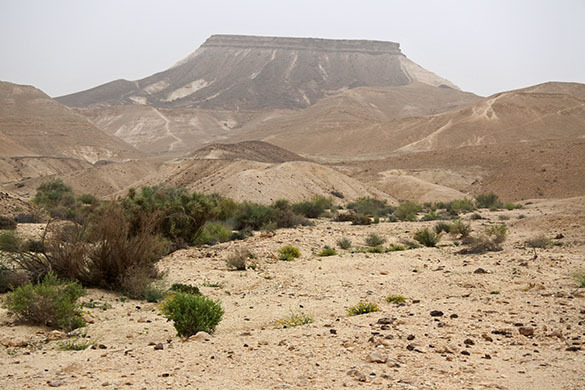 On the way back to Mitzpe Ramon, I stopped at another exposure of the Ora Formation just south of Makhtesh Ramon. 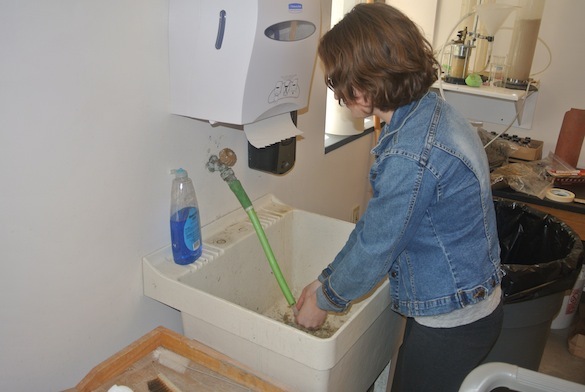 It is a place very familiar to several Wooster students, especially Andrew Retzler and Micah Risacher who did much of their I.S. field research on those steep slopes ahead. We often stopped to look at the Ora exposed in the wadis. The view is a bit hazy because of the typical Saharan dust that moves into the Negev in the spring. There is a fantastic bivalve-bored carbonate hardground in the Ora Formation at this second locality. It is especially well exposed now, probably because of winter floods washing away the soft sediment covering it. One amazing bed, about a half-meter thick, is packed with thin-shelled oysters. Every time I visit I look for encrusting bryozoans here, but none have appeared. They’ve got to be there! It was a good start for these few days of fieldwork. I’m now acclimated, my geological eyes are tuned, and I’m ready for tomorrow’s fieldwork in the Matmor Formation of Makhtesh Gadol — the main event! These pretty little oysters are from the Matmor Formation (Middle Jurassic, Callovian) of Makhtesh Gadol in southern Israel. Because I regrettably missed going to Israel for fieldwork this summer, I thought I’d choose these exquisite fossils to be celebrated this week. The genus is Actinostreon Bayle, 1878. There may be more than one species here, so we’ll just leave the identification at the genus level. Actinostreon is very common in some units of the Matmor Formation. Hundreds can be found scattered through a single unit. They were epifaunal filter-feeders as all oysters, and like most attached to hard substrates. 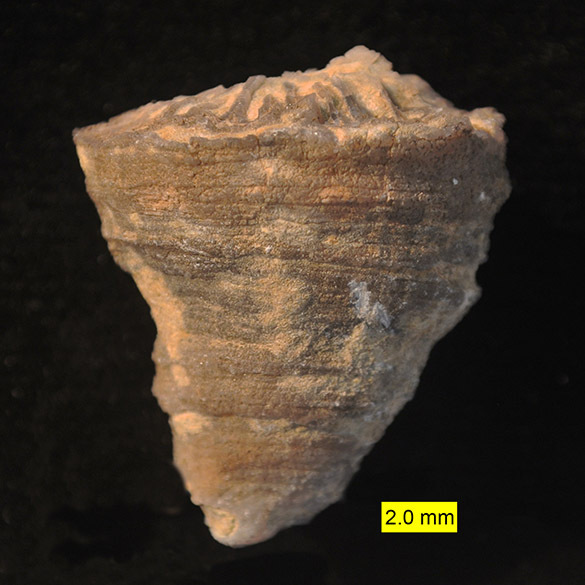 The Actinostreon in the Matmor Formation commonly settled on small shell fragments in marl, giving them the appearance of dwelling in mud. Their zig-zag commissures (their shells are formally called plicate) strengthened their shells with ribs and helped them maintain high water inflow for filter-feeding with a relatively small opening (gape). The French paleontologist and mineralogist Claude Émile Bayle (1819-1895) named the genus Actinostreon in 1878. Bayle was raised in the beautiful French coastal city of La Rochelle. 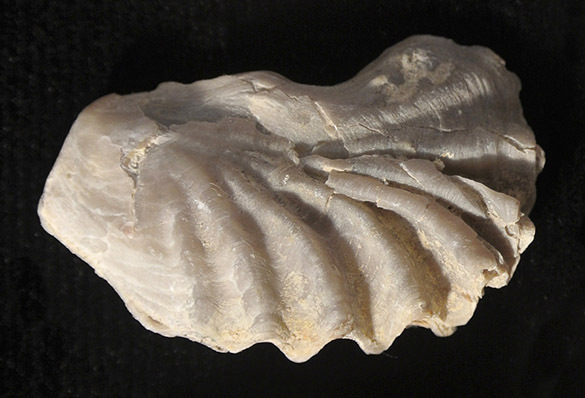 His family was related to Alcide Dessalines d’Orbigny (1802-1857), one of the greatest French naturalists, so collecting and analyzing fossils and modern shells was encouraged. Bayle studied at the Ecole Polytechnique and then the Ecole des Mines. After his schooling he was employed as the Chief Engineer of the Corps des Mines. He assembled a large collection of fossils (about 185,000 of which were cataloged). In 1848 he began teaching paleontology and mineralogy at the Ecole des Mines, retiring in 1881. His paleontological specialties were mollusks (especially Jurassic and Cretaceous bivalves) and Cenozoic mammals. He had a fairly modest publication record until he produced his magnum opus, an 1878 fossil atlas to accompany a new geological map of France. It is here that he described Actinostreon, and many other new taxa. Alberti, M., Fürsich, F.T. and Pandey, D.K. 2013. Seasonality in low latitudes during the Oxfordian (Late Jurassic) reconstructed via high-resolution stable isotope analysis of the oyster Actinostreon marshi (J. Sowerby, 1814) from the Kachchh Basin, western India. International Journal of Earth Sciences 102: 1321-1336. Bayle, E. 1878. Fossiles principaux des terrains: Explication carte geologique France. France Service Carte Geologique, vol. 4, pt. 1, pl. 132. Hirsch, F. 1980. 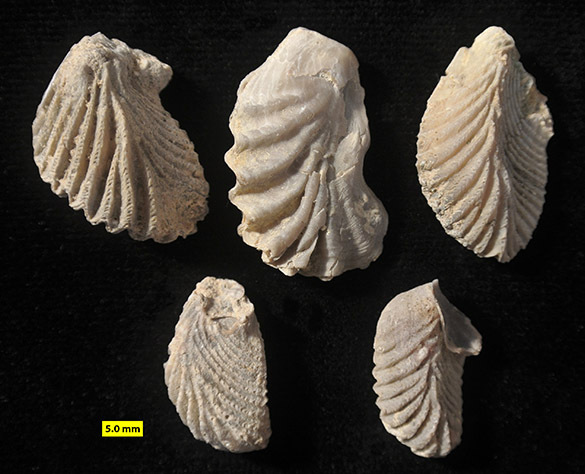 Jurassic bivalves and gastropods from northern Sinai and southern Israel. 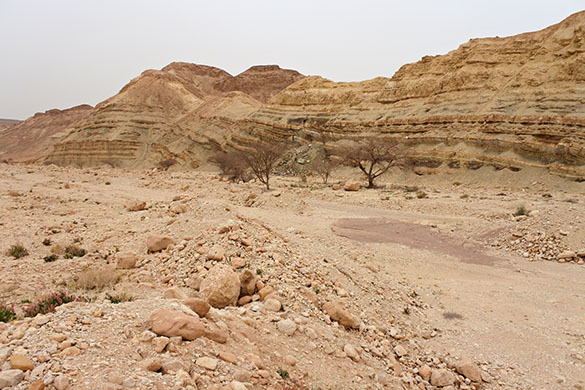 Israel Journal of Earth Sciences 28: 128-163. Machalski, M. 1998. 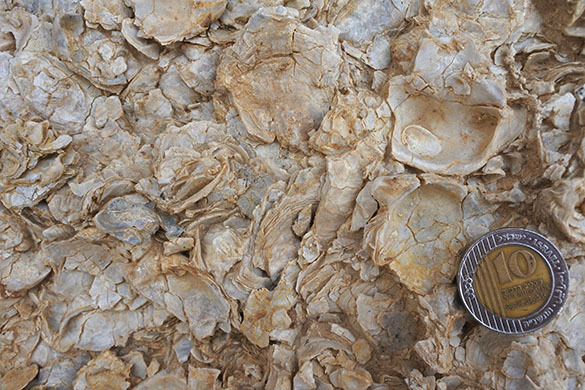 Oyster life positions and shell beds from the Upper Jurassic of Poland. Acta Palaeontologica Polonica 43: 609-634. Paul Taylor (Natural History Museum, London) is, along with his other talents, an expert on the folklore of fossils. His accounts of how fossils have been used and imagined in the past are fascinating, especially to paleontologists who work with them every day. (We had an example this summer at Whitby, England, with Saint Hilda and the ammonites.) So I was primed when Tim Palmer told me about an article on “Lapis Judaicus” or “Jews’ Stone” by Christopher Duffin (2006). Tim thought the medicinal value of these things was particularly appropriate for me. At the top of this post is a clavate (club-shaped) spine from the echinoid Pseudocidaris. I collected it years ago from the Matmor Formation (Middle Jurassic, Callovian) exposed in Makhtesh Gadol, southern Israel. In classical and medieval times this would have been a Jews’ stone (or jewstone). Its shape is critical, of course, but also its provenance in the Middle East. 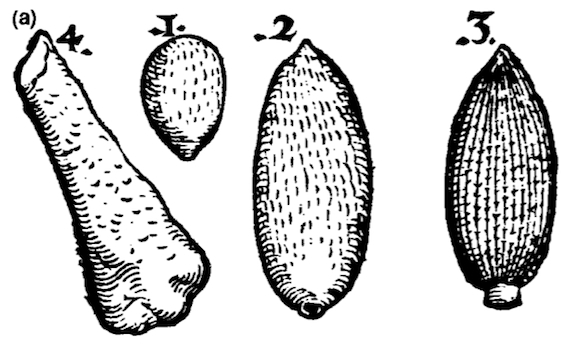 This is an illustration from Gesner (1565) showing a set of Jews’ stones (taken from Duffin, 2006, fig. 2). The image on the right (“.3”) is very close to our Pseudocidaris spine. The range of shapes for Jews’ stones was broad; all simply had to have this general clavate appearance and be from the Holy Lands. Jews’ stones are examples of a kind of sympathetic magic attached to natural objects. It was thought that the globular shape of these spines resembled a bladder, and so these stones could be used to treat urinary disorders of various kinds. Sometimes the ancient prescriptions called for them to be sucked, but more often the stones were ground into a powder and combined with other exotic ingredients for consumption either orally … or other ways. The Jews’ stones were thought to have both preventative value as well as curative. And that is why Tim recommended them to me. One of their primary uses was for the cursed kidney stones. Nice to know I could have a potential treatment available right there on the outcrop! Duffin, C.J. 2006. Lapis Judaicus or the Jews’ stone: the folklore of fossil echinoid spines. Proceedings of the Geologists’ Association 117: 265-275. Gesner, C. 1565. De Rerum Fossilium. Lapidum et Gemmarum maxime, figures et similitudinibus Libel’: non solum Medicis, sed omnibus rerum Naturae ac Philologiae studiosis, utilis et jucundus futurus. Publisher unknown, Zürich. Gould, S.J. 2000. The Jew and the Jew Stone. Natural History 6: 26-39. 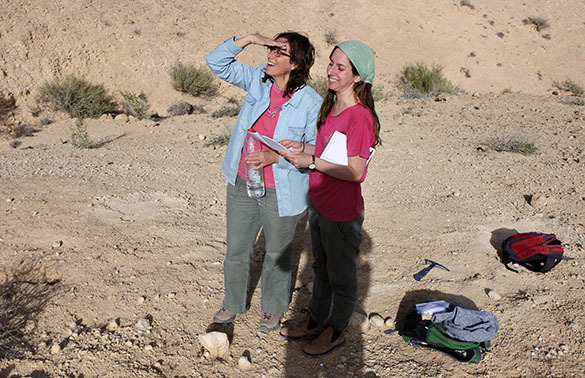 This post is in honor of Yael Leshno, a graduate student at The Hebrew University of Jerusalem who is beginning her dissertation on the Middle Jurassic marine fossils of Israel. I’m proud to be on her committee. She will have some fascinating material to work with, and she has great ideas to test. This will be a fun and productive project. Among the Jurassic groups Yael will concentrate on are the calcareous sponges. This is ambitious because they are poorly known and the literature is replete with outdated names and concepts. Her work will be of great value, though, because sponges can tell us a lot about the environments in which they flourished. They may also give us much needed information on the biogeographical context of the Jurassic faunas of the Middle East. 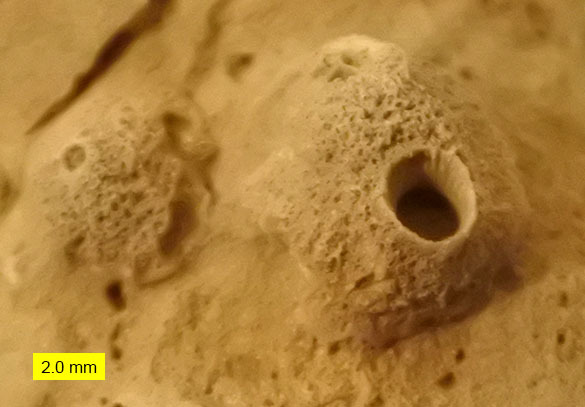 In this closer view of one of the Matmor sponges you can see the complex spicular network of the exterior (the structure that held the living cells). You will also note near the base the coiled tube of a sabellid worm named Glomerula gordialis (Schlotheim, 1820). Here is a top view looking into the osculum of the largest specimen. Sponges are filter-feeders, sucking in water through their exterior pores, filtering the organic material out, and then sending the used water out an osculum like this. This sponge type is traditionally named Peronidella Hinde, 1893; it would be then placed within the Family Peronidellidae WU, 1991. I’m suspicious of this name because it used for sponges from the Devonian through the Cretaceous, so it is likely a form-genus (meaning a named form that may not have particular systematic value). Yael will no doubt section these common Matmor sponges and find enough internal detail to come up with a more useful name. George Jennings Hinde (1839-1918; image from Woodward, 1918) named the fossil sponge genus Peronidella in 1893. Hinde grew up in a farming family in Norwich, England. He was clearly a self-starter, studying classical languages and science on his own as a boy. When he was about 16 he listened to a lecture given by a clergyman on the Scottish geological polymath Hugh Miller (1802-1856), who had recently died tragically. Hinde was intrigued and began to explore geology. In 1862, after beginning his own farming, Hinde visited the geological collection at the British Museum in London. He began an acquaintance there with a family relative, the famous geologist and paleontologist Henry Woodward (1832-1921). In that same year Hinde sold his farm and moved to Argentina to raise sheep. A few years later he traveled to North America and began an epic seven years studying geology, traveling across the eastern half of the continent. (He must have had a considerable source of income for this!) He enrolled as a student in Toronto University under the paleontologist H.A. Nicholson (1844–1899) and began to produce his first geological papers. When he returned to England in 1874 he was elected a Fellow of the Geological Society of London. He continued to travel, this time over much of Europe and the Middle East. In 1880 he finished his PhD under Professor Karl Alfred Ritter von Zittel (1839-1904). He had a long career after that with numerous papers and scientific awards. Long et al. (2003) adds to this biography that Hinde very much wanted women to be allowed membership in the Geological Society of London, a point neglected in the obituary by Henry Woodward (1918). Hinde did not, alas, live to see the success of his progressive quest. The first woman was elected a Fellow of the GSL on May 21, 1919, a little more than a year after his death. Hinde, G.J. 1893. A monograph of the British fossil sponges, Part III. 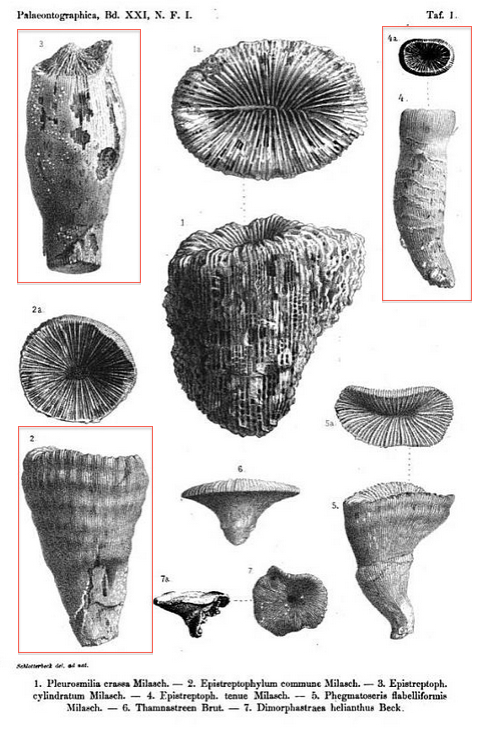 Sponges of the Jurassic strata, p. 189-254. The Palaeontographical Society, London. Hurcewicz, H. 1975. 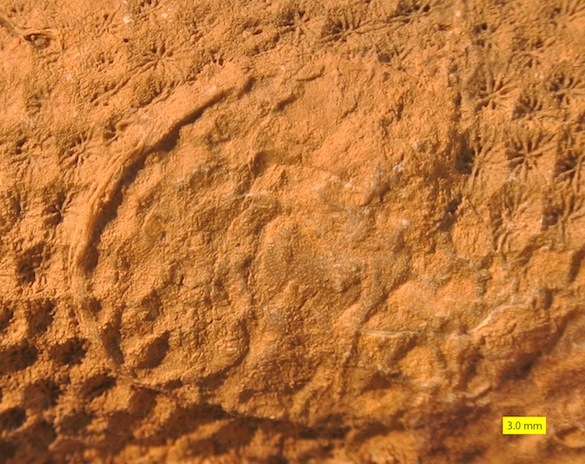 Calcispongea from the Jurassic of Poland. Acta Palaeontologica Polonica 20: 223-291. Long, S.L., Taylor, P.D., Baker, S. and Cooper, J. 2003. Some early collectors and collections of fossil sponges represented in The Natural History Museum, London. The Geological Curator 7: 353-362. Vinn, O. and Wilson, M.A. 2010. 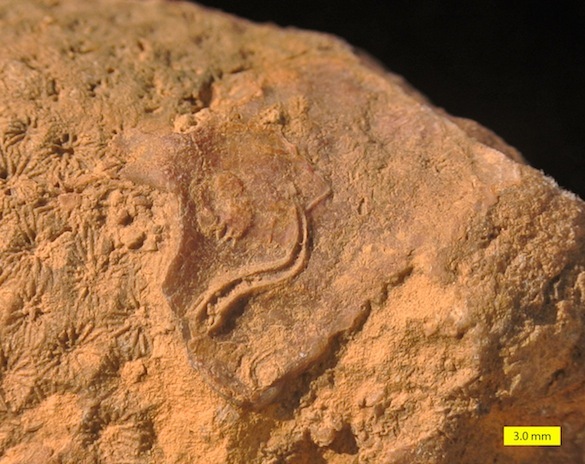 Sabellid-dominated shallow water calcareous polychaete tubeworm association from the equatorial Tethys Ocean (Matmor Formation, Middle Jurassic, Israel). Neues Jahrbuch für Geologie und Paläontologie 258: 31-38. Woodward, H. 1918. Obituary: George Jennings Hinde, Ph.D.(Munich), FRS, FGS, VP Pal. Soc. Geological Magazine (Decade VI) 5: 233-240. Zittel, K.A. 1879. Studien über fossile Spongien, Teil 3. — Bayer. Akad. d. Wiss., math. naturwiss Cl. Abb. 13: 91-138. This week’s fossil is again in honor of Annette Hilton (’17), now retired as my Sophomore Research Assistant this year. 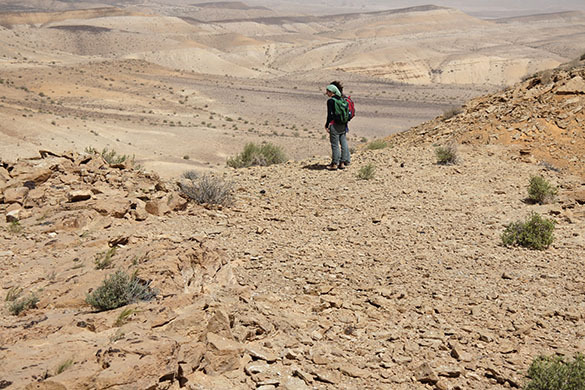 She has been assessing with great skill a large and diverse collection of scleractinian corals from the Matmor Formation in Hamakhtesh Hagadol in the Negev Desert of southern Israel. These specimens were collected during paleoecological studies by the Wooster paleontology lab and our Israeli colleagues. Above is a fantastic specimen of Microsolena Lamouroux 1821. We are looking at the top of a gumdrop-shaped corallum, with the corallites (which held the polyps) as shallow pits with radiating septa. This is the reverse view of the coral, showing its concentric growth lines. The jumble in the center is shelly debris on which the coral originally established itself on the muddy seafloor. Note that the preservation here includes numerous little circles. These are centers of silica replacement called beekite rings (a form of chalcedony). Above is a closer view of the beekite preservation. The silica circles have concentric rings of their own. 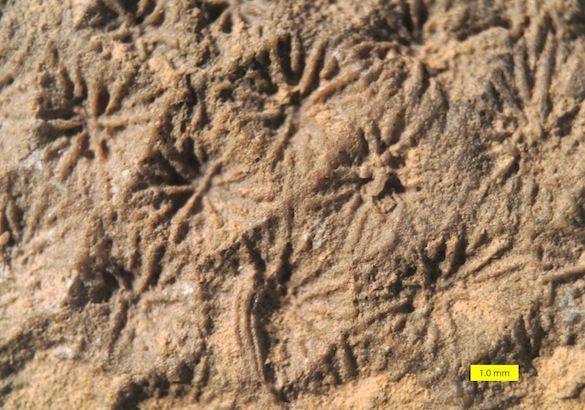 This kind of preservation (a type of silicification) is common in the Matmor Formation. Corals like this one started as aragonitic skeletons and then were replaced by calcite and silica. I suspect the calcitization took place first because of the fine degree of preservation for most of the corallum. So how do we get a term like beekite? Meet Rev. 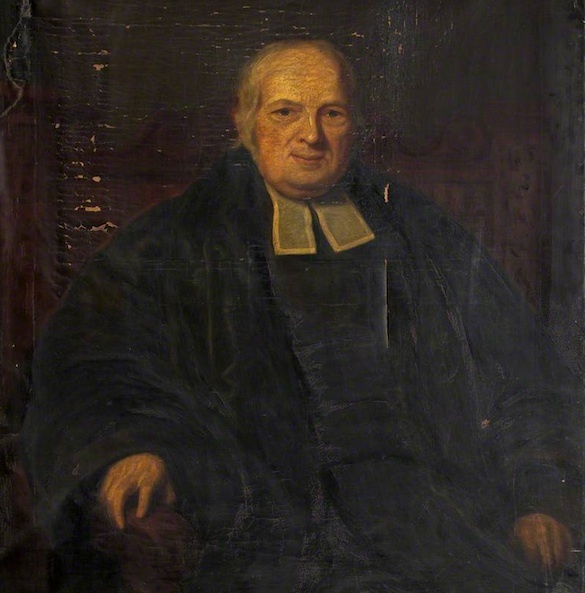 Henry Beeke (1751-1837), a rather unlikely scholar to make it to this blog. Beeke was an Oxford graduate in divinity, with a strong concentration in history. He became a prestigious Regius Professor of Modern History at Oxford. He was sought after as an expert of economics and taxation at the beginning of the 19th Century. As with many divines of the time, Beeke also pursued natural history, specializing in botany. At some point in his career he was noted as having described what we now call beekite, but I can’t find where in the literature. All I have is a brief mention of “Beekite, a new mineral, named after Dr. Beeke, at the Corbors” in Blewitt (1832, p. 15). Henry Beeke had the distinction of seeing this mineral variety named after him during his lifetime, which is rare in science. Blewitt, O. 1832. The panorama of Torquay: a descriptive and historical sketch of the district comprised between the Dart and Teign. Second edition. London: Simpkin and Marshall, 289 pages. Church, A.H. 1862. XV. On the composition, structure, and formation of Beekite. The London, Edinburgh, and Dublin Philosophical Magazine and Journal of Science 23(152): 95-103. Nose, M. and Leinfelder, R. 1997. Upper Jurassic coral communities within siliciclastic settings (Lusitanian Basin, Portugal): implications for symbiotic and nutrient strategies. Proceedings of the 8th International Coral Reef Symposium 2: 1755-1760. Pandey, D.K., Ahmad, F. and Fürsich, F.T. 2000. 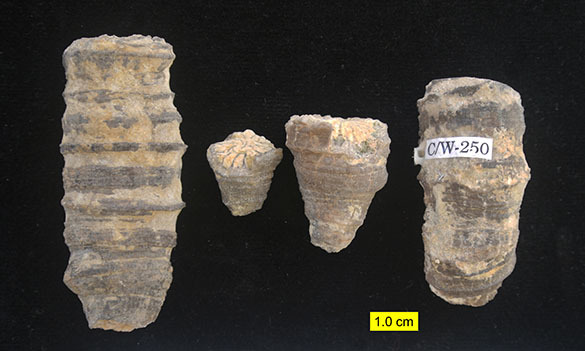 Middle Jurassic scleractinian corals from northwestern Jordan. Beringeria 27: 3-29. Pandey, D.K. and Fürsich, F.T. 2001. 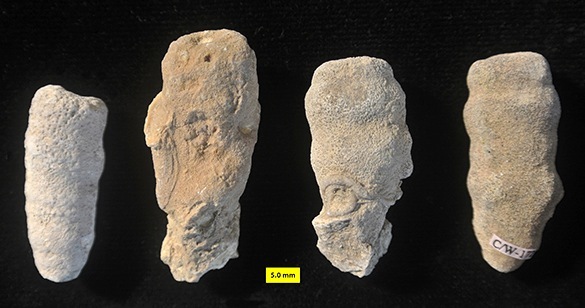 Environmental distribution of scleractinian corals in the Jurassic of Kachchh, western India. Journal Geological Society of India 57: 479-495. Pandey, D.K. and Fürsich, F.T. 2005. 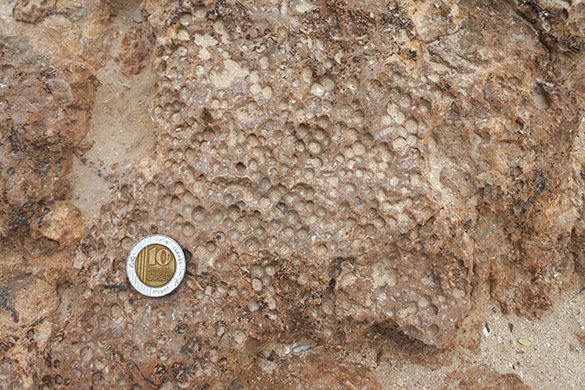 Jurassic corals from southern Tunisia. Zitteliana 45: 3-34. Wilson, M.A., Feldman, H.R. and Krivicich, E.B. 2010. 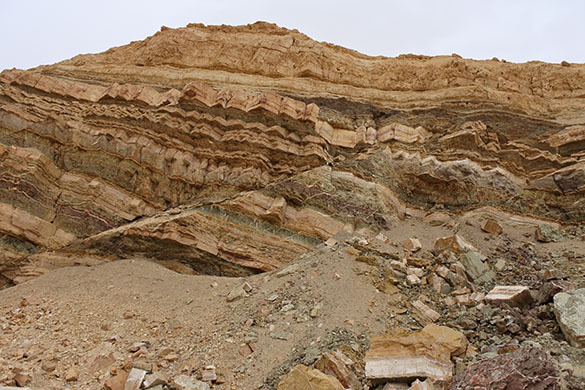 Bioerosion in an equatorial Middle Jurassic coral–sponge reef community (Callovian, Matmor Formation, southern Israel). Palaeogeography, Palaeoclimatology, Palaeoecology 289: 93-101. 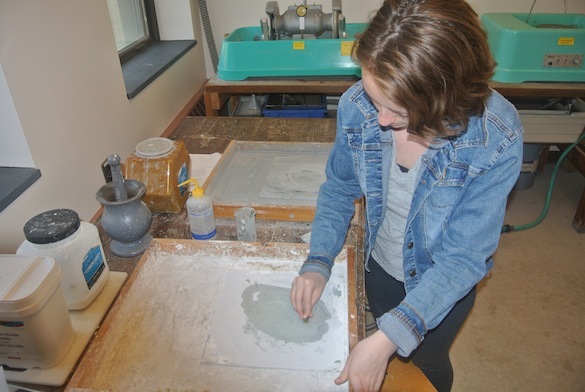 My retiring Sophomore Research student, Annette Hilton (’17), is excellent at making acetate peels. 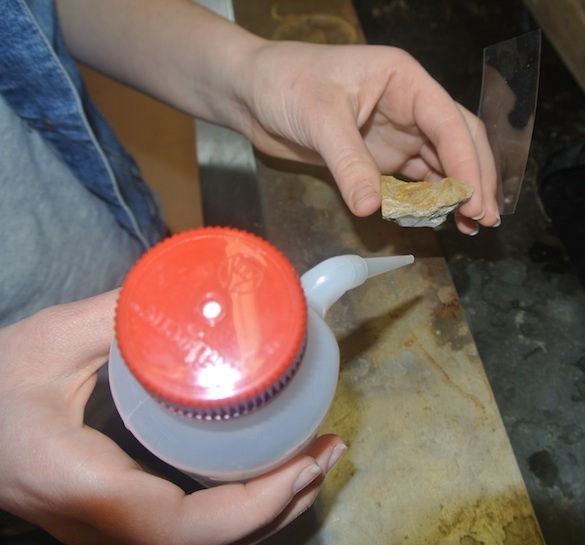 These peels, like the one above she made from a mysterious Callovian (Middle Jurassic) coral, show fine internal details of calcareous fossils and rocks. 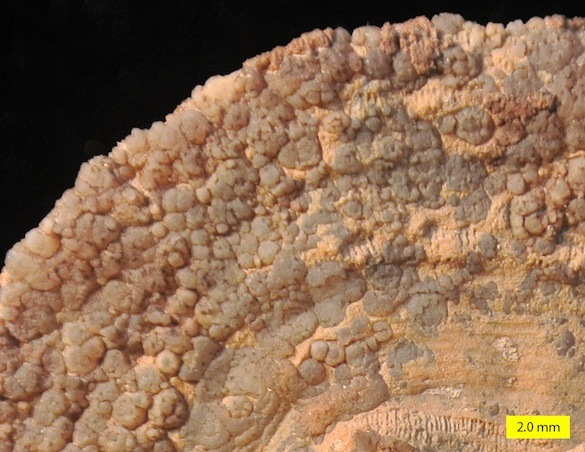 This is a closer view of the acetate peel of the coral showing incredible detail in the radiating septa and connecting dissepiments. 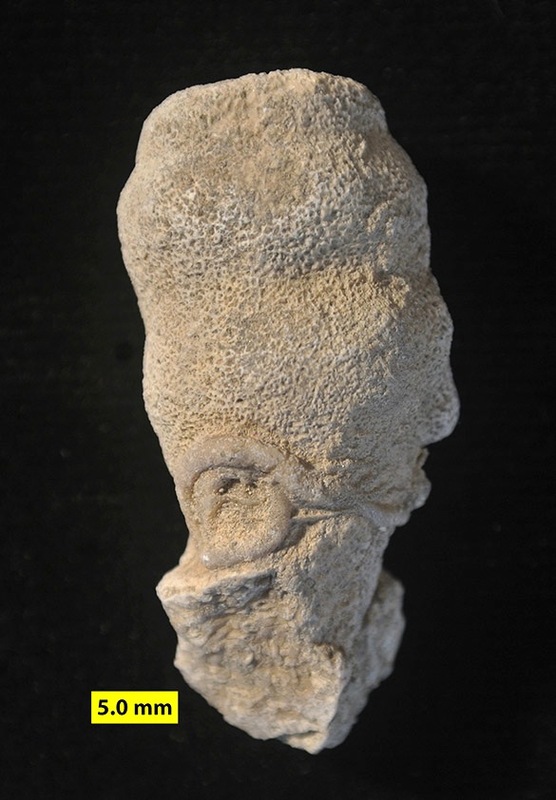 This is a solitary coral from the Matmor Formation of southern Israel. We thought we knew what it was until we examined this peel and saw features we can’t match with any coral taxa. (Experts are invited to tell us what it is!) This view looks like it is from a thin-section, but it is all acetate and was made in about 20 minutes. 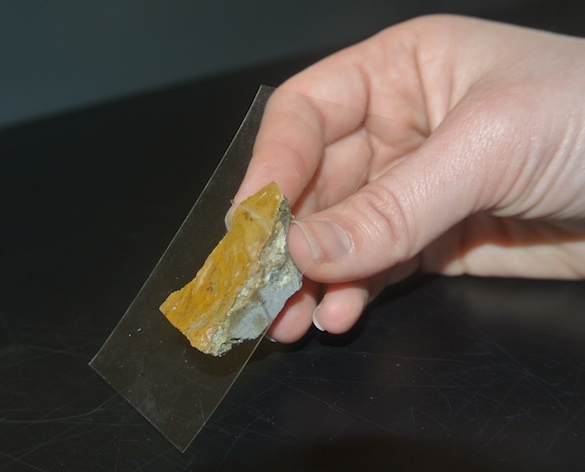 An acetate peel is a replica of a polished and etched surface of a carbonate rock or fossil mounted between glass slides for microscopic examination. 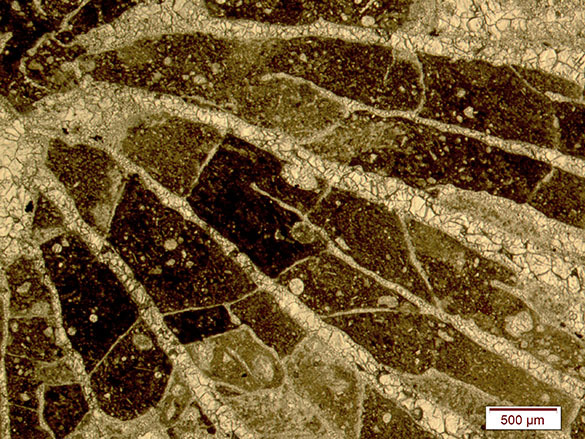 Peels cannot give the mineralogical and crystallographic information that a thin-section can, but they are faster and easier to make. For most carbonate rocks most of the information you need for a petrographic analysis can be recovered from an acetate peel. 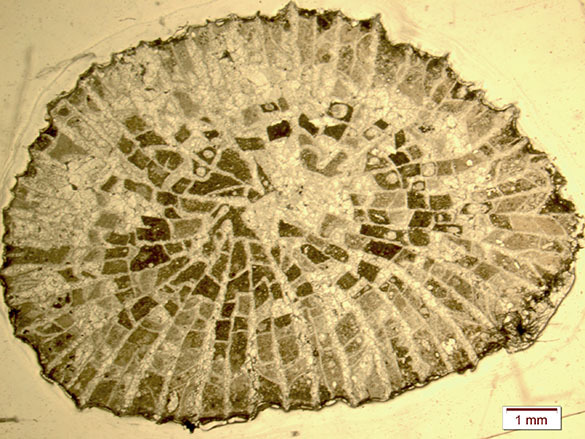 In many paleontological applications, an acetate peel is preferred to a thin-section because you get essentially two dimensions without sometimes confusing depth. A trim saw for rock cutting. Grinding grit (3.0 µm) in a water slurry on a glass plate. A supply of 5% hydrochloric acid in a small dish. A supply of water in another small dish. A squeeze bottle of acetone. We’re now going to show you how we make peels. This process was worked out by my friend Tim Palmer and me back in the 1980s. See the reference at the end of this entry. Annette is in her required safety gear about to start the process by cutting a fossil. She needs to cut a flat surface that is usually perpendicular to bedding in a carbonate rock, or through a fossil at some interesting angle. The specimen approaches the spinning diamond-embedded blade of the rock saw. 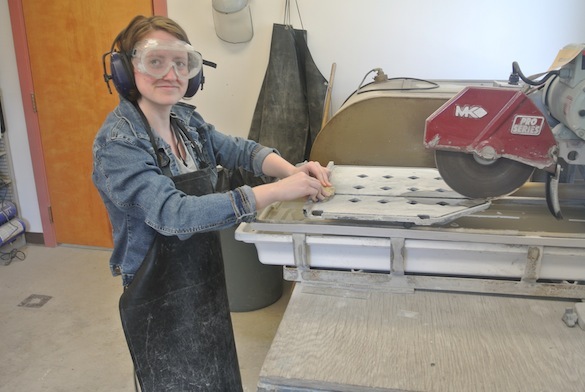 Annette is holding the rock sample steady on a carriage she is pushing towards the blade. It is important to hold the specimen still as the blade cuts through it. My camera is faster than I thought. Not only do you see those suspended drops of water, the spray is frozen in the air! The cut is almost complete. 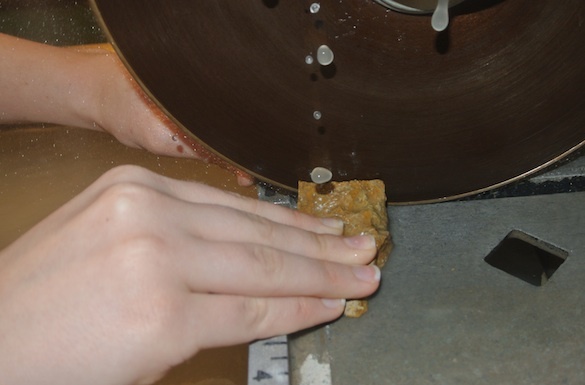 Now we use a diamond-embedded grinding wheel (45 µm or 30 µm) to polish the surface cut with the saw. This will be the side from which we make the acetate peel. 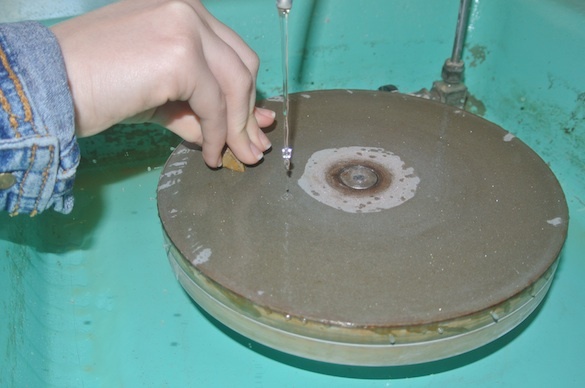 A closer view of the rock (which contains an embedded bryozoan, by the way) being polished flat on the spinning wheel. The best peels are made from surfaces that have the finest polish. We are using a 3.0 µm grit-water slurry on a glass plate to again polish the rock surface as smooth as possible, removing all saw and grinding marks. Keep the plate wet and push down hard to polish the cut surface in the grit slurry. 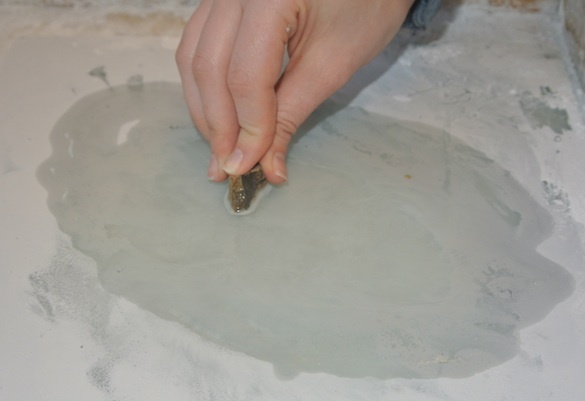 With carbonate rocks and fossils it takes no more than five minutes here to get an excellent polish. Wash the specimen thoroughly in water to remove all grit. Check the polished surface for grinding marks. If you see any, return to the glass plate and slurry for more polishing. 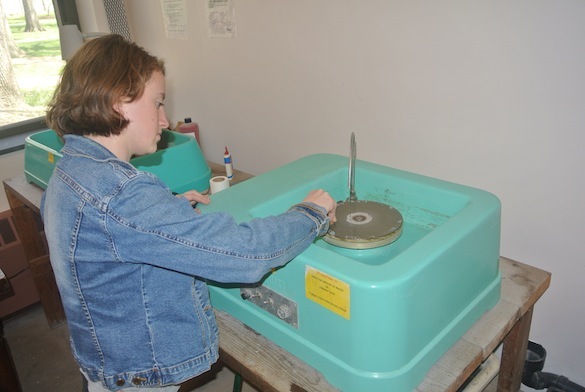 Annette is suspending the polished surface of the specimen downward into the acid bath. She dips it in only a couple millimeters or so. The acid reacts with the carbonate and fizzes. 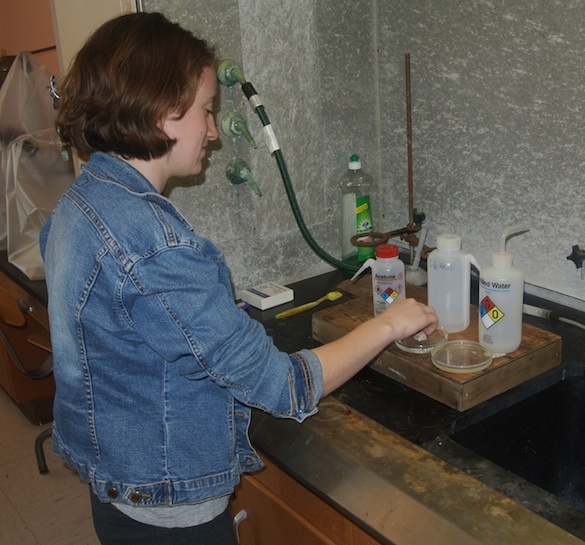 Her fingers are safely above the action, but if you’re nervous you can use tongs to hold the specimen. 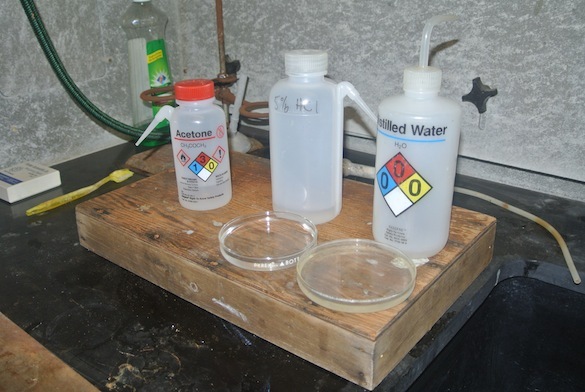 We usually keep the specimen in the acid for about 15 seconds, and then quench it with the water in the second dish. The etching time will vary with the strength of the acid and carbonate content of the specimen. 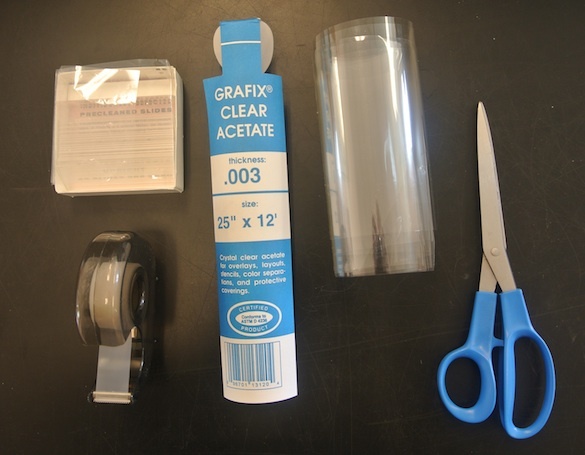 This is the kit you need to make the acetate peel itself. Note that we use a thin acetate rather than the thick sheets preferred by others. The tricky part. 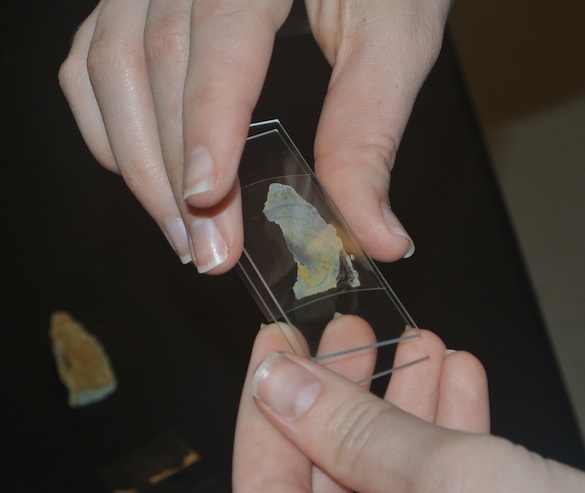 When the specimen is dry, cut a piece of acetate somewhat larger than the etched surface. 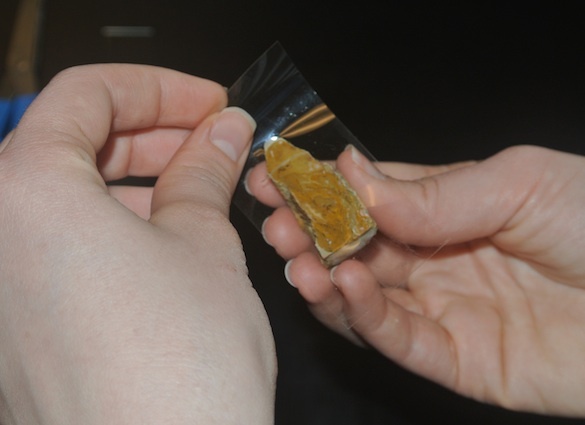 We then hold this acetate and the specimen in one hand, and the squeeze bottle of acetone in the other. The next step is to flood the etched surface, which is held flat and upwards, with the acetone and quickly place the acetate on the wetted surface. The acetate will adhere fast, so smooth it out with your fingers across the etched surface. At this point the acetone is partially dissolving the acetate, causing it to flow into the tiny nooks and crannies of the etched surface. The acetone evaporates and the acetate hardens into this microtopography. If you did it correctly, you now have a sheet of acetate adhering entirely to the etched surface. With practice you learn how to avoid bubbles between the acetate and specimen. Opinions vary and how long to let the system thoroughly dry. We found that we can proceed to the next step in about five minutes. Now you peel! Slowly and firmly pull the acetate off the specimen. Carefully trim the acetate with scissors. 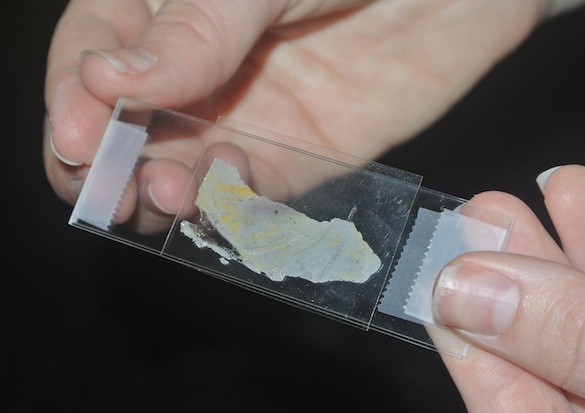 Place this peel between two glass slides, squeeze tight, and seal the assemblage like a sandwich with transparent tape. You have now made an acetate peel. Easy! Here’s our finished product. Twenty minutes from rock saw to peel. You’ll have to wait until another blog post to see what this particular peel shows us! Another exquisite little coral this week from the collection of Matmor Formation (Middle Jurassic, southern Israel) corals Annette Hilton (’17) and I are working through. We believe this is Epistreptophyllum Milaschewitsch, 1876. It is a solitary (although more on that in a moment) scleractinian coral found in marly sediments at our location C/W-366 in Hamakhtesh Hagadol. I’m always impressed at how well preserved these corals are considering their original aragonitic skeletons were replaced long ago. One cool thing about this specimen is the near 90° bend it took during growth. Apparently it was toppled over midway through its development but survived and grew a twist so it could keep its oral surface (where the polyp resided) upwards. Another interesting observation is the small bud visible near the base. Gill (1982) suggested that the solitary Epistreptophyllum in the Jurassic of Israel may have been able to branch into separate individuals. Pandey and Lathuilière (1997) doubted this and suggested that Gill had misidentified his Israeli specimens. Maybe so, but we’re pretty sure we have Epistreptophyllum here, and we definitely have budding. We’re always open to other ideas! Here is another view of the specimen in its living position after the fall. I love the sweep of the vertical ribs as it made the bend. To complete the tour of this specimen, here’s a view of the oral surface where the polyp lived. The radiating lines are the septa that extended vertically through the interior of the corallite. Epistreptophyllum was named in 1876 by Constantin Milaschewitsch. Here is Plate 50 from that massive work. Epistreptophyllum is marked by the red rectangles. (Note the misspelling of the genus in the caption for figure 2.) I wish I knew more about Mr. Milaschewitsch, but his particulars are thus far not available. I can tell he worked in Moscow and St. Petersburg, Russia, but that’s all. If anyone knows more about this man, please add your information in the comments. Gill, G.A. 1982. Epistreptophyllum (Hexacorallaire Jurassique), genre colonialou solitaire? Examen d’un matériel nouveau d’Israel. Geobios 15: 217-223. Milaschewitsch, C. 1876. Die Korallen der Nattheimer Schichten. Palaeontographica 21: 205-244. Pandey, D.K. and Lathuilière, B. 1997. 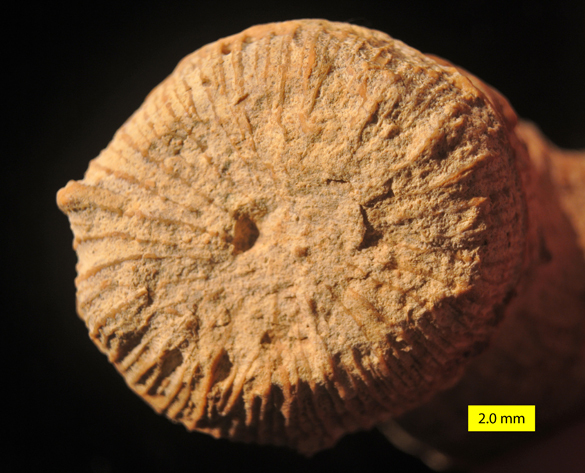 Variability in Epistreptophyllum from the Middle Jurassic of Kachchh, western India: an open question for the taxonomy of Mesozoic scleractinian corals. Journal of Paleontology 71: 564-577. Our fossil this week is one I don’t share with my Invertebrate Paleontology classes until they’re ready for it. Those of us who grew up with Paleozoic fossils think we recognize it right away. Surely this is a solitary rugose coral? It has the right shape and the fine growth lines we call rugae (think “wrinkles”). This view below of the oral surface is not surprising either, unless you’re an enthusiast of septal arrangements. 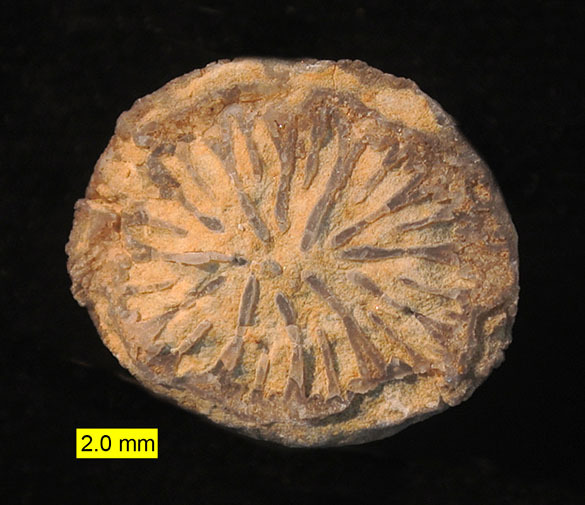 Instead of a rugose coral, though, this is a scleractinian coral from the Matmor Formation (Middle Jurassic, Callovian) of Hamakhtesh Hagadol, Israel. It is part of the collection of Matmor corals Annette Hilton (’17) and I are working through. This coral belongs to the genus Axosmilia Milne Edwards, 1848. These corals are excellent examples of evolutionary convergence. The scleractinians are only very distantly related to the rugosans. They do not share a common ancestor with a calcareous skeleton, let alone a cone-shaped one like this. Instead the scleractinians like Axosmilia developed a skeleton very similar to that of the solitary rugosans, probably because they had similar life modes in similar environments, and thus similar selective forces. The rugosans, though, built their skeletons out of the mineral calcite, whereas the scleractinians use aragonite. (This specimens are calcite-replaced, like our specimen last week.) The vertical septa inside the cone are also arranged in different manners. Rugosans insert them in cycles of four (more or less), giving them a common name “tetracorals”; scleractinians have septal insertions in cycles of six, hence they are “hexacorals”. 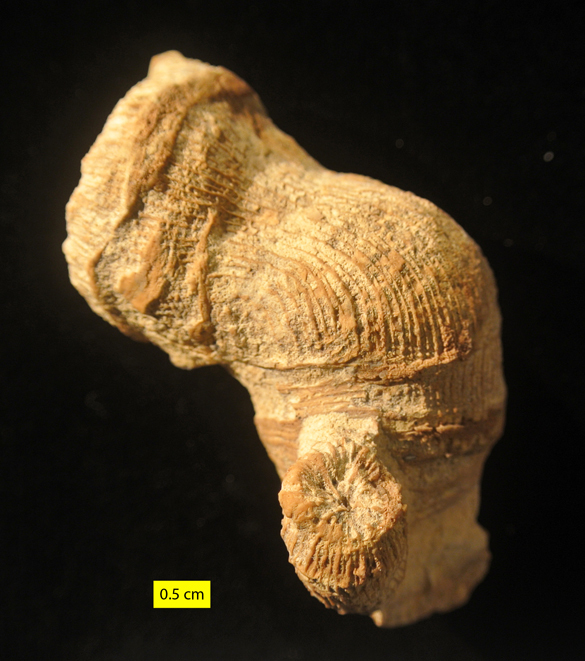 Rugose corals went extinct in the Permian; scleractinians are still with us today. Our friend Axosmillia appeared in the Jurassic and went extinct in the Cretaceous. Rugose coral skeletons in the Paleozoic are commonly encrusted with a variety of skeletal organisms, and many are bored to some degree. I expected to see the same sclerobionts with these Jurassic equivalents, but they are clean and unbored. I suspect this means they lived semi-infaunally (meaning partially buried in the sediment). Axosmilia was named by the English-French zoologist Henri Milne-Edwards (1800-1885) in the politically complex year of 1848. Henri was the twenty-seventh (!) child of an English planter from Jamaica and a Frenchwoman. He was born in Bruges, which is now part of Belgium but was then under the control of revolutionary France. Like many early 19th century scientists, Milne Edwards earned an MD degree but was seduced away from medicine by the wonders of natural history. He was a student of the most accomplished scientist of his time, Georges Cuvier, and quickly became a published expert on an amazing range of organisms, from crustaceans to lizards. The bulk of his career was spent at the Muséum National d’Histoire Naturelle in Paris. When he was 42 he was elected a foreign member of the Royal Society, receiving from them the prestigious Copley Medal in 1856. He died in Paris at the age of 85. Fürsich, F.T. and Werner, W. 1991. 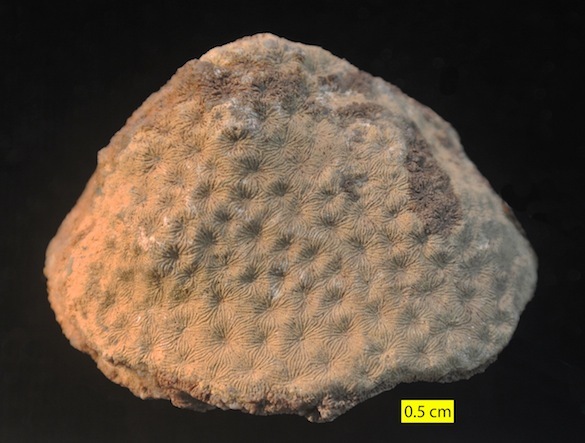 Palaeoecology of coralline sponge-coral meadows from the Upper Jurassic of Portugal. Paläontologische Zeitschrift 65: 35-69. Martin-Garin, B., Lathuilière, B. and Geister, J. 2012. The shifting biogeography of reef corals during the Oxfordian (Late Jurassic). A climatic control?. Palaeogeography, Palaeoclimatology, Palaeoecology 365: 136-153. 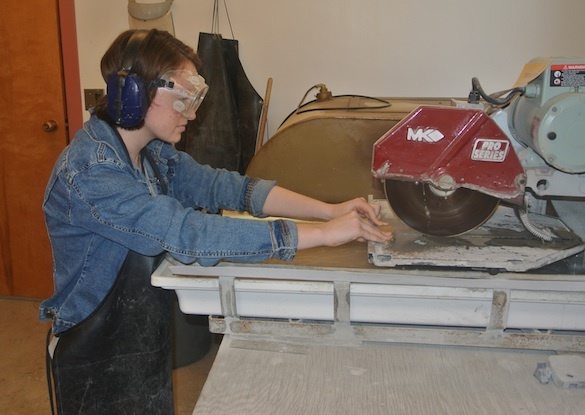 This week’s fossil is in honor of Annette Hilton (’17), who is my Sophomore Research Assistant this year. 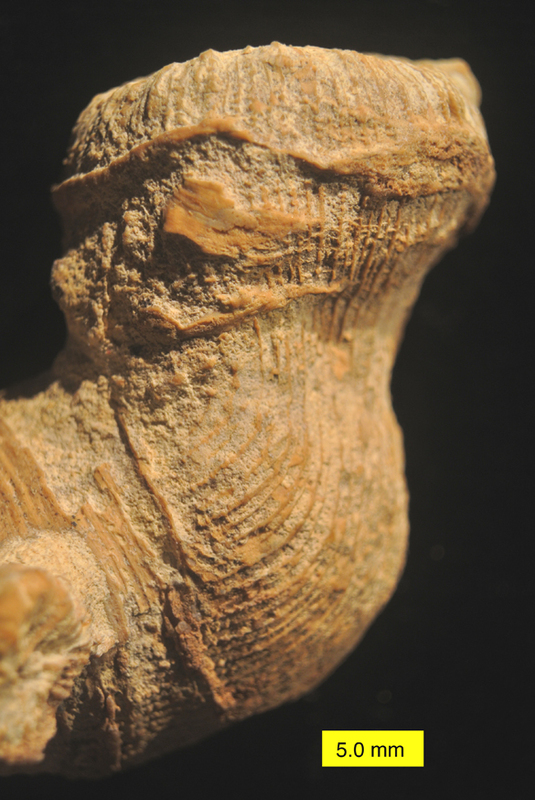 She has been diligently working through a large and difficult collection of scleractinian corals from the Matmor Formation (Middle Jurassic, Callovian) of Hamakhtesh Hagadol, Israel. These specimens were collected as parts of many paleoecological studies in our Wooster paleontology lab, so I thought it was time they received some systematic attention on their own. I knew it would be difficult, but Annette was up to the task and has done a splendid job. The above specimen is a scleractinian coral of the genus Amphiastrea Étallon, 1859. It was collected from locality C/W-227 in the makhtesh. 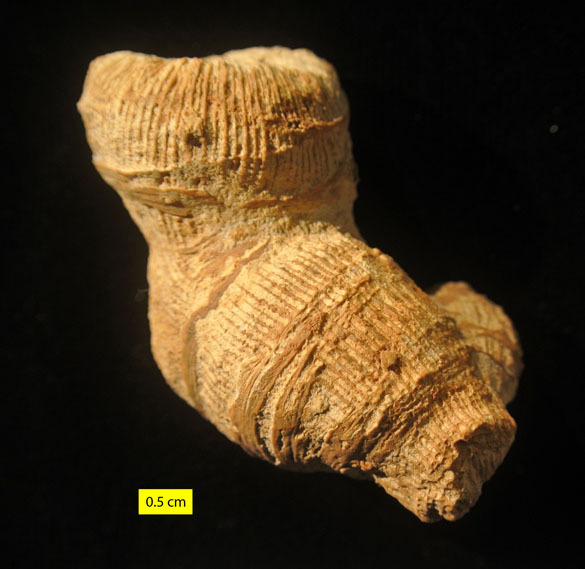 Considering the original was aragonite, it is remarkably preserved in a calcitized version. 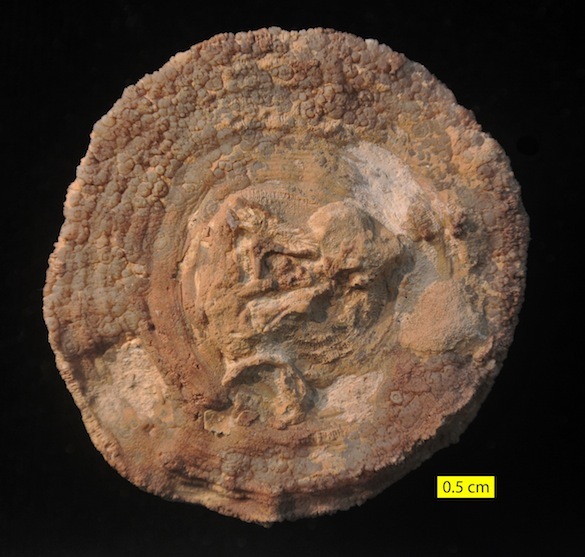 The large disks stuck to it are encrusting bivalves, probably of the genus Atreta. Here we see the reverse with more encrusters. 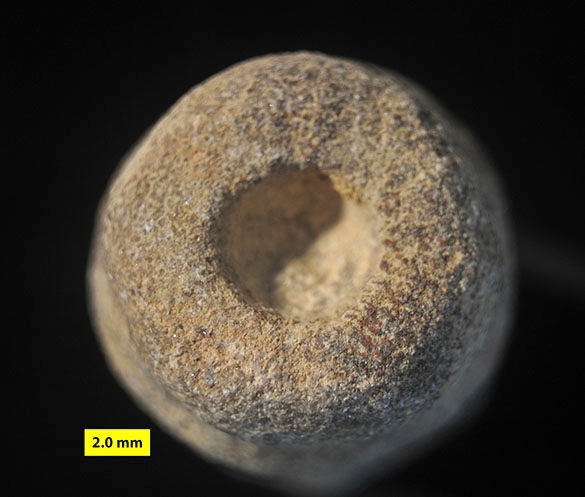 It is apparent that this cylindrical specimen was encrusted on all sides while it was in its erect living position, or this piece rolled around loose on the seafloor for an extended interval. One of the encrusting bivalves was itself encrusted by a serpulid worm, which left part of its twisty calcitic tube behind. This thin, ghostly encruster is probably the bivalve Plicatula. A close view of the corallites shows how well preserved they are on the surface of the coral. Each of these pits shows the vertical septa (walls of a sort) that were underneath the coral polyps in life. Despite this beautiful outer preservation, the interior of the specimen is mostly occupied by blocky calcite crystals. This coral was found in a marly sediment, which explains why it is not locked into a solid piece of limestone as many Jurassic corals are. Amphiastrea apparently preferred environments with a significant amount of siliciclastic sediment (see Pandey and Fürsich, 2001, and other references below). I hope my students and I can further study this diverse and abundant coral fauna in the Matmor Formation. Annette Hilton has prepared the way. Claude Auguste Étallon (1826-1862) named the genus Amphiastrea in 1859. He was a prominent paleontologist and geologist in his time. He was only 35 years old when he died, though, and has almost completely dropped out of the literature in English, except for the numerous invertebrate taxa he named. (There is a kind of immortality in our system of adding author’s names to taxa.) Using my Google Translator skills, I can read in the French literature that he was born to “an honest merchant family” in Luxeuil, France. 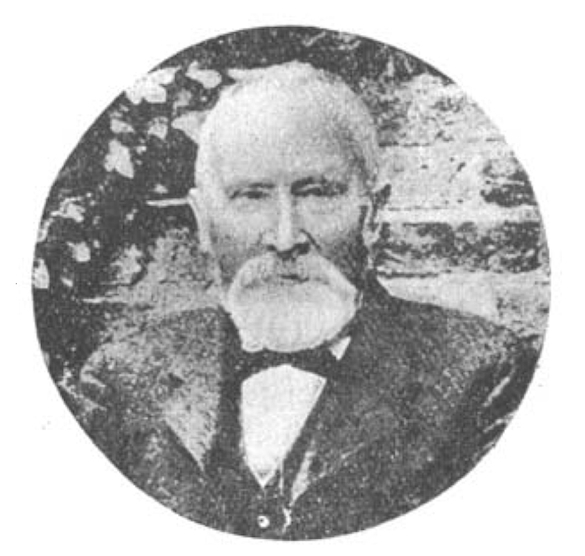 He was a mathematics teacher first at collège Paul Féval à Dol-de-Bretagne and then later several other institutions. He developed a specialty in the rocks and fossils of the local Jurassic. Étallon created and published a geological map (“Carte géologique des Environs de St. Claude”), which was quite advanced for the time. The Late Jurassic turtle Plesiochelys etalloni was named after him in 1857. 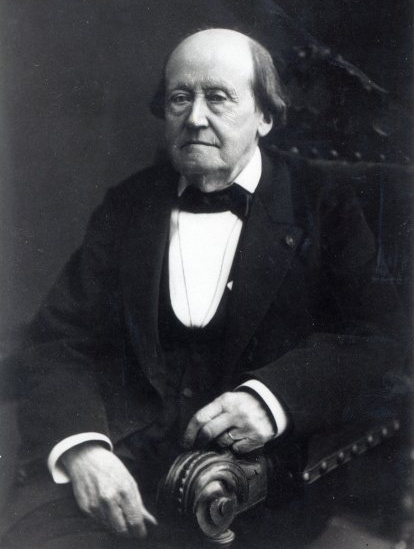 Auguste Étallon died suddenly of “the rupture of an aneurysm after two days of a slight indisposition” in February 1862. Here’s to the memory of the energetic, productive and too short-lived Auguste Étallon. d’Amat, R. 1975. 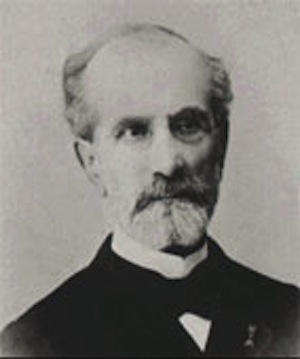 Étallon, Claude Auguste. Dictionnaire de Biographie Française 13: 163-164. Löser, H. 2012. Revision of the Amphiastraeidae from the Monti D’Ocre area (Scleractinia; Early Cretaceous). Rivista Italiana di Paleontologia e Stratigrafia 118: 461-469. Wilson, M.A., Feldman, H.R. and Krivicich, E.B. 2010. 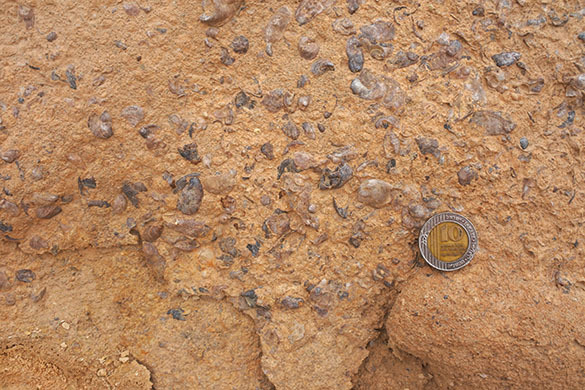 Bioerosion in an equatorial Middle Jurassic coral-sponge reef community (Callovian, Matmor Formation, southern Israel). Palaeogeography, Palaeoclimatology, Palaeoecology 289: 93-101.